Our back garden in the snow. Let’s build a snowman, says my father. The winter light is milky, shot through with a tentative sun. I am wearing a brown pinafore. Its fabric is thick and scratchy. Do I have gloves? I don’t know. I don’t feel the cold. The snowman is made before I know it. He is a fine creature, as tall as me. Dad fetches pieces of coal from the coal bunker for his eyes. We have a grooved metal rubbish bin at our back door. The snowman needs a hat. The bin lid will do the job. It clangs as we lift it. Years later, my daughters sing songs from the hit Disney film ‘Frozen’. 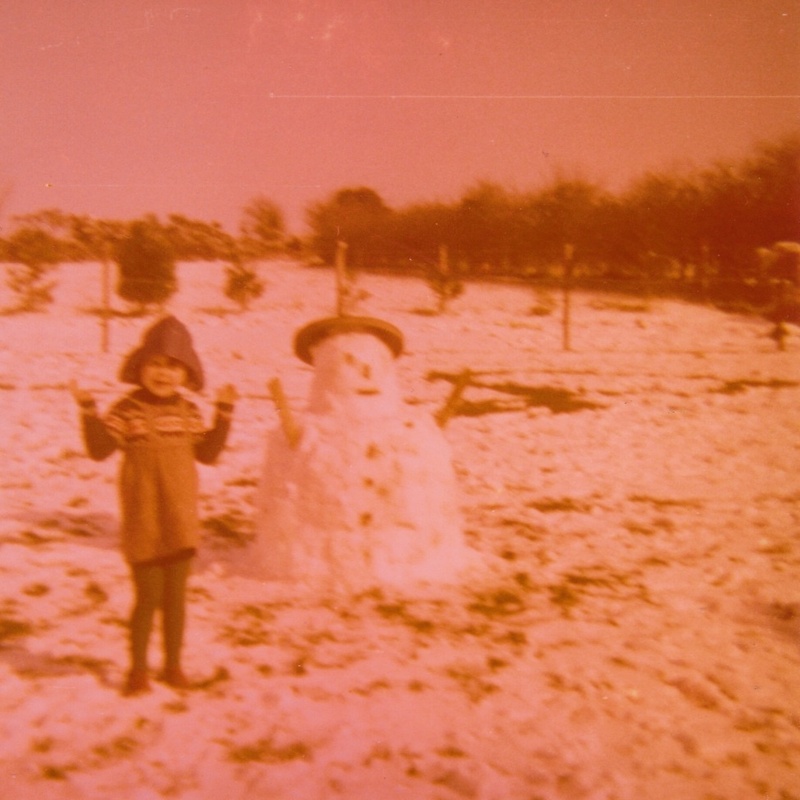 The character of the little snowman who longs for summer brings me back to my own first snowman, his stick arms pointing skywards, his wide-brimmed metal hat shielding his eyes from the sun. Put up your arms like the snowman, says Dad. Click. Do I really remember the day itself, or have I retrofitted a memory from the photograph? I am sure I can still hear the metallic ring of the bin lid. It is 1977. I am just gone three. Posted on September 14, 2014, in Writing and tagged ireland, irish writer, memoir, new irish writing, orla shanaghy. Bookmark the permalink. 7 Comments. A beautifully orchestrated memoir from local writer Orla Shanaghy. To move effectively between the past and present is an art in itself. Lovely work. Love the way you use ‘Heaney’ type language to convey the sound of the bid lid! Evocative writing – use of the present tense brings you immediately into the moment, even though it was so long ago. Like how you weaved the memory into your own present. And you were very cute!